Nick Matthew isn’t taking his eye off the ball, but Sheffield’s three-time World Squash champion is looking to his own future and that of the sport’s potential new stars with the setting up of an academy. 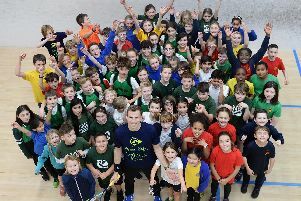 The One Health Group-sponsored Nick Matthew Academy is based at Hallamshire Tennis and Squash Club on Ecclesall Road and was launched last week with some of the young starlets taking part in an exhibition match with the 35 year-old. The launch of the Nick Matthew Apex Squash Academy, sponsored by One Health Group, at Hallamshire Tennis and Squash Club on Ecclesall Road in Sheffield. Nick is pictured with some of the students. It’s a fresh step for Matthew, who recently won the British National title for an eighth time, but one he is looking forward to as he edges towards the twilight of his playing career. “It was nice to launch off the back of a success - keep the momentum going,” said Matthew. And the base at Hallamshire, where Matthew cut his teeth as a youngster provides what he believes to be the perfect surroundings. The launch of the Nick Matthew Apex Squash Academy, sponsored by One Health Group, at Hallamshire Tennis and Squash Club on Ecclesall Road in Sheffield. Nick is pictured with Scott Maughan, 12, and Rebecca Miller, 14. The launch of the Nick Matthew Apex Squash Academy, sponsored by One Health Group, at Hallamshire Tennis and Squash Club on Ecclesall Road in Sheffield. Some of the students in action.